This event takes place within the territory of the Lekwungen speaking peoples (as represented today by the Songhees and Esquimalt Nations). Let’s continue to dismantle the colonial structures that surround this city. ALL THAT OTHER IMPORTANT STUFF……. At CRUSH there is zero tolerance for any type of racist, sexist, ableist, fatphobic, transphobic or homophobic behaviour. MMMmmmk?! If you feel uncomfortable at any time please take care of yourself and/or find one of our community support folks to help out. Last call for drinks is 2:00 am and everyone must be out by 2:30 am so, please come early to get this dance party started! This is a 19+ event, two pieces of ID will be required. No smoking within 7 meters of the VEC entrance. Washrooms are gender inclusive. There are couches, chairs and tables for folks who need to rest their bodies and minds to the back of the venue space. The Victoria Event Centre (VEC) is a non-profit organization (Victoria Multi-Cultual Society) that operates a multi-purpose rental venue for non-profits, arts groups, cultural communities and everyone in between. Accessibility is an extremely important concern for the Crush collective, as our community has clearly expressed that our events are not accessible for all of the people for whom these events are intended. Although there is much more that needs to be done to increase accessibility at our events overall, it’s also important to communicate what is available now. The Victoria Event Centre is on the second storey of a building up a rather steep flight of 27 stairs. There is a continuous handrail up the stairwell and our workers/organizers are available to provide assistance as directed. There is also an extremely old freight elevator around the back of the building but it is not operable at the moment. Inside the Victoria Event Centre there is a gender inclusive wheelchair accessible washroom that technically fits necessary size dimensions, but is missing a bar and a handrail beside the toilet. There are two stalls, in the washroom, but only one of these has been renovated to meet 5’x5′ wheelchair clearance. The Victoria Event Centre is a low-light environment, and although there are no fluorescents outside of the bathrooms and some brighter lit areas for lip-reading and signing, hazards are not well-lit and the lighting is not even throughout the venue. Strobe lights are not permitted. 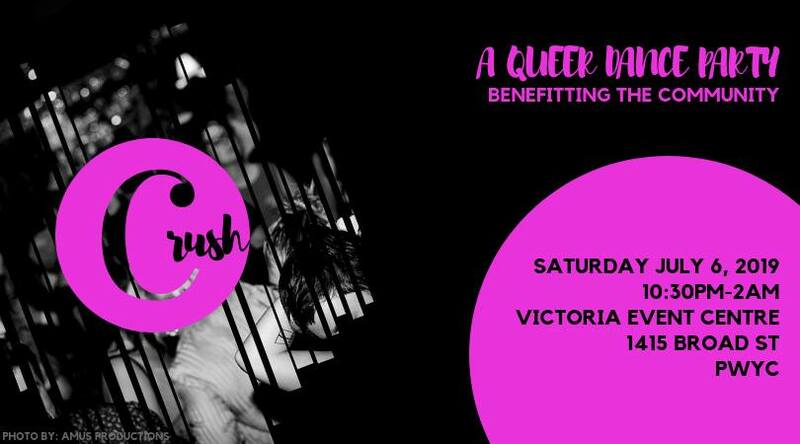 Crush is a club night in Victoria for the queer community and its allies. We are here to host a club night for the queer community, while employing members of the community and giving back to causes in the Victoria area.